Grew Up… with magic in his blood. Alfred always wanted to be a magician, and he started learning about the tricks of the trade as early as he can remember. Living… the secretive life of a magician. Alfred puts illusions up even between himself and his best friends. As a shill for the popular “Milton the Magician,” Alfred meets Robert Angier, another young magician. The two begin a long rivalry when Angier’s wife dies during a water tank stunt and Angier blames Alfred. Alfred soon becomes a fully-fledged magician, “The Professor,” while Angier becomes “The Great Danton,” and the two continue to compete hungrily for top billing as the greatest magician in the world. Interests… illusion, mysticism, and commitment to the craft. 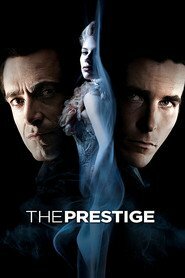 Alfred is obsessed with “the prestige,” which is the part of a magic trick when – after you have transformed an ordinary object into something extraordinary – you bring it back, restoring the object’s original form. Relationship Status… single. He soon meets Sarah, a beautiful woman who strikes Alfred’s fancy. He determines to use his magic to charm her into loving him. Challenge… becoming the best magician ever. Alfred doesn’t simply want to touch people, or to woo enormous crowds; he wants to go down in history as the one magician who changed everything. Much to his chagrin, however, his nemesis Angier wants the same thing – and there’s only room at the top for one. Personality… committed, motivated, and secretive. Alfred is the true man of illusion. He will never tell the secrets to his tricks. He strives to reach a level of true magic. Simple illusions bore him. He is well above and beyond the average magician, but he will never stop his search for greatness until he is satisfied that he has truly shocked the world. Alfred Borden's popularity ranking on CharacTour is #2619 out of 5,000+ characters. See our top-ranked characters and read their profiles.